Dewan Perwakilan Mahasiswa (DPM) Faculty of Economics and Business Universitas Brawijaya becomes legislative institution of faculty level that function as legislator for Active Student S1 FEB UB. The stewardship of DPM FEB UB begins with the handover of office in early 2018. In its stance, DPM FEB UB deploys staffs who will assist DPM FEB UB members to carry out the main duties and functions of DPM FEB UB. Therefore DPM FEB UB recruited staff to assist the performance of DPM FEB UB. Sufficient human resources in the organization, need to also do the formation of character. There will be organizations that have a lot of resources, but do not have good character and can be an organizational supporter. In addition, it is also necessary to identify staff members for the organization and how they will be part of the organization. To be able to create students who have an organizational spirit, there needs to be activities that can motivate students. In the early stages of introduction of DPM FEB UB, legislative, and as organizational training, DPM FEB UB attended Legislator Training. Understanding individual characters is easy. It takes a process to get to know each other. Through this Legislator Training it is expected that every individual can start to understand the colleagues who will build the DPM FEB UB together. This is also done with professional work to be done by capable organizations using the time available with human resources that can work with others. of DPM FEB UB mission, giving motivation , and enthusiasm for the board of DPM FEB UB to get better DPM FEB UB. The event continued with the first book about leadership material delivered by Jefrie Nandy Satria as the Chairman of DPM FISIP UB 2017. After the first material finishes, finish with rest, prayer, and lunch. Furthermore, the second trial material on legislative presented by Rio Danu Wicaksono as Chairman of Law Commission and Law of DPM UB 2017. The last material, that is material presented by Gaung Andaka R. P. as the Chairman of DPM FEB UB 2015 on about DPM. The material event ended, the event continued with the reading of pledge by the Staff of DPM FEB UB 2018 led by the Chairman of DPM FEB UB 2018. The reading of this pledge reflects the seriousness of commitment to DPM FEB UB 2018. The final agenda, namely briefing and division of Training Group Legislator Day II will be delivered the next day. 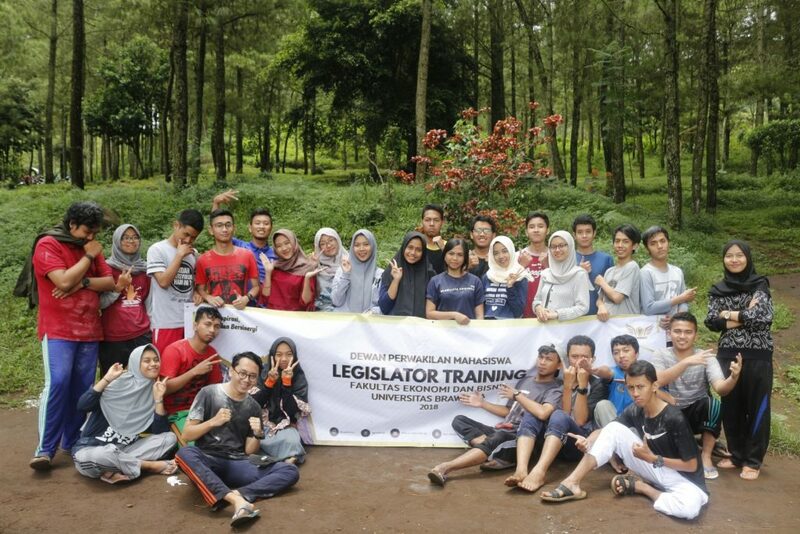 After Legislator Training Day I is held, the next day is Legislator Training Day II. The second series of events was held on Sunday 25 February 2018 held at Bedengan, Selorejo campground. The journey to Bedengan starts at 07.00 and outbound is done starting at 08.00. There are three groups and several games that each group must pass. The game is organized based on the organizational essence which aims to familiarize all staff of DPM FEB UB 2018, instill a sense of brotherhood, and increase the mutuality among Members and Staff of DPM FEB UB 2018. Improve knowledge of organizational life and develop softskill board either individually or group especially in the field of legislative, constitution, and bureaucracy. Establish a board of DPM FEB UB The solid 2018 period can realize the implementation of DPM FEB UB working program during one period of stewardship in the future.